Mite treatments will be the hot topic for all beekeepers very soon. 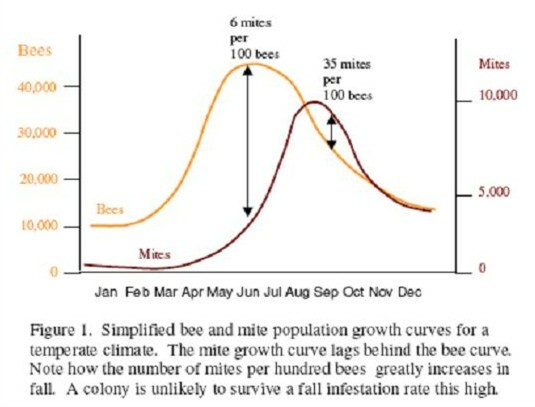 Look at the graph above about the bee and mite population and the timeline. The Varroa population lags the bee population, up until early September. 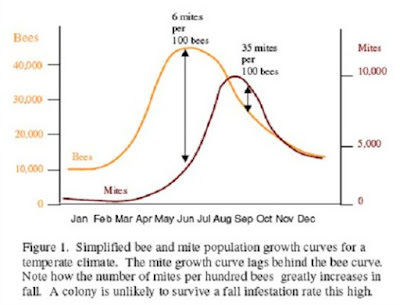 Then the mite population keeps increasing as the bee population goes down. This high infestation of mites damages the bees physically and also exposing honeybees to viruses. This high infestation of mites is what kills honeybee colonies. Beekeepers need to stop this rising mite population during the month of August before the Varroa population explodes. Looking at the graph one can see there is a sharp rise in the month of August in the mite population. Treating colonies in September in many cases is too late. The bees may be so damaged by the rising mite population that they cannot recover. Starting in late August, and into fall, the new bees emerging will be winter bees. Winter bees have a different physiology than summer bees, they have more fat deposits to handle the rigors of winter better than summer bees could. Winter bees will live for 6 months. Winter bees need to emerge out of the cells as mite free as possible. Winter bees weakened by being parisitized by mites stand a tough time for long term survival. Winter bees emerging healthy with very low mite counts, have a great chance at winter survival. Overwintered colonies usually make much more honey than a new colony. For ALL beekeepers, treating colonies in August is the time to do it. If you are a beekeeper that kills your colonies off every year and get new bees in the spring, YOU need to treat for mites as well. Failure to treat for mites at the proper time can affect your neighbors overwintering success. Be a good neighbor and treat all colonies in August.